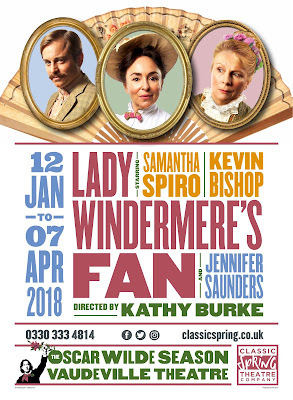 Last Friday night Stuart and I went to see a preview of Oscar Wilde's Lady Windermere's Fan at the Vaudeville Theatre in London's glitzy West End. And for a 126 year-old play, it is still pretty damned funny. Directed by Kathy Burke this high calibre cast brought the four act production alight with each act being funnier than the last. 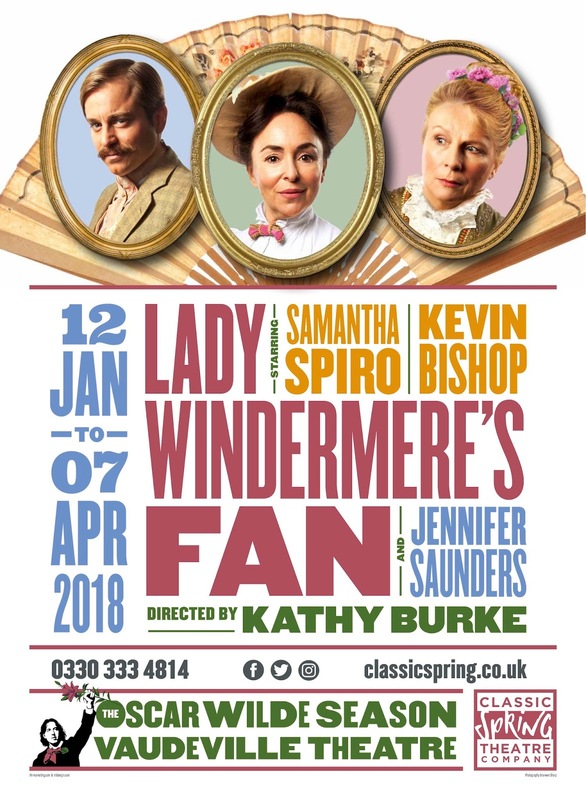 Both Samantha Spiro and Kevin Bishop are excellent but the highlight for me was Jennifer Saunders playing The Duchess of Berwick and her musical interlude at the end of act three. Worth the ticket price alone. Admittedly, the plot of the piece is perhaps a little thin at times (a suspected affair that never was and the shame of being a 'fallen' woman) but the plot is not really the point here. Ostensibly, about marriage, infidelity, and the battle of the sexes Wilde uses the self-aware daft snobbery of the upper classes as a vehicle to place an avalanche of witty and urbane words and phrases in the mouths of his privileged English toffs. The very people who probably would be sitting in their theatre seats watching it for the first time 126 years ago. He is lampooning both his characters and his audience. The dialogue as one might expect is extremely drole and at times quite moving. As love-sick Lord Darlington utters mournfully, "We are all in the gutter, but some of us are looking at the stars." "I can resist anything except temptation." "It is absurd to divide people into good and bad. People are either charming or tedious." "In this world there are only two tragedies. One is not getting what one wants, and the other is getting it." "Scandal is gossip made tedious by morality." "What is a cynic? A man who knows the price of everything, and the value of nothing. And a sentimentalist? A man who sees an absurd value in everything and doesn’t know the market price of any single thing." "Ladies and Gentlemen. I have enjoyed this evening immensely. The actors have given us a charming rendition of a delightful play, and your appreciation has been most intelligent. I congratulate you on the great success of your performance, which persuades me that you think almost as highly of the play as I do myself."